Understand or decide why a child involved in music is important to you. This will likely be different for each one of your children. For one, it may be a way to learn self-discipline. Another may seek to fit with family tradition, or it may be to bloom their natural talent. Perhaps it will be a trade-off for another extra-curricular activity. Whatever the reason, it will help determine the level of intensity and priority the music lessons and practice are given. The potential of a music scholarship or one day marching with the high school band is not a goal (or reality) for every child involved in music. Determine what makes your child want to practice. Perhaps, the satisfaction of a well-learned piece of music, or a content music teacher, or even a happy parent isn’t enough. Offer a weekly allowance for practicing! Require music practice in exchange for extra-curricular activities they do love, or have a penalty of paying for the weekly music lesson if practicing isn’t done. Again, consider how influential the involvement in music is to you, and incentivize accordingly. After a while the incentives may be able to decrease as the child begins to love their music involvement more. Here is an example of how practicing music became an uphill battle for us...for a while. My husband and I fought for almost two years with one of our children to play the piano. Lessons were a nightmare and practicing produced tears and contention. Yet, we both felt strongly that this child needed to have some musical involvement. After only two years of lessons, we allowed this child to stop taking lessons. However, he is still required to play the piano every day in exchange for participating in the activities of his choosing. He works at his own pace, he plays what he wants, and gets to choose how long to play. Adjusting my narrow-minded vision of all of my children enrolled in weekly piano lessons was life changing in our home. Who doesn’t like praise? We all do. Allow the children opportunities to perform for other people. Even the most basic version of Twinkle Twinkle Little Star will cause someone to smile. Encourage recitals, or playing while family or friends sing. Take the children to a rest home or allow them to play at a family party. Not only may their confidence increase, but they’ll feel a sense of accomplishment for those seemingly endless hours of practice. This is gravely important to deepen their love for the musical realm overall. Try recording their practice session sometime and then record it again months later. Hearing and seeing their own progression may be very motivating for them. Not just for them, but also for you as a parent! 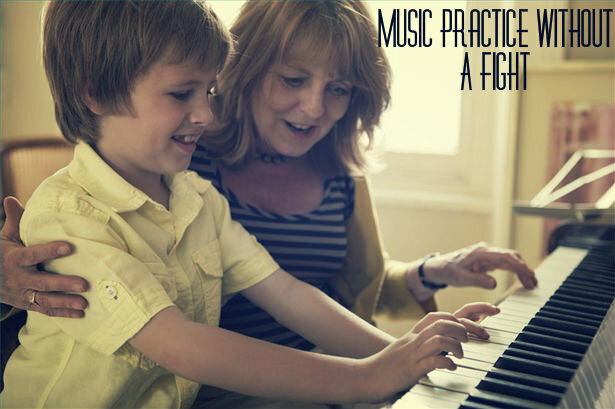 How you get your children to practice music without a fight may be very different from how I do it, but the general principles are the same. Our results will be varied. Some of our children may end up playing at Carnegie Hall, some may accompany a choir, some will receive a musical scholarship, and some will never touch an instrument again, when they leave home. But we all know there is deep power in music as a whole. Help them find it and hang on to it.